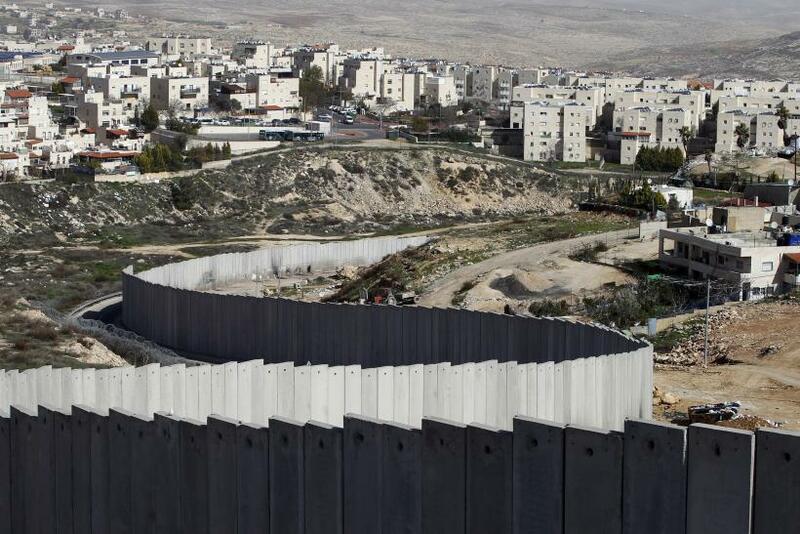 A section of the controversial Israeli barrier is seen between the Shuafat refugee camp (right) in the West Bank near Jerusalem and Pisgat Zeev (rear), in an area of Israel annexed to Jerusalem after capturing it in the 1967 Middle East war, Jan. 27, 2012. JERUSALEM -- From Al-Walajah, a Palestinian village in the southern West Bank, Jerusalem’s Teddy Stadium, one of the venues for the European Under-21 Football Cup in June, is only a few hundred meters away. But this village on a hill couldn’t be further from the city and the international audiences watching games broadcast from so close. Soon, it will be enclosed by the separation barrier Israel is building to isolate itself from Palestinians. The combination of concrete walls, wire fences and checkpoints, begun in 2002, is being constructed in stages. Its purpose: to protect Israel from terrorist attacks. The Israeli government says it’s a fundamental part of the state’s security. Palestinians say it disrupts their lives. And on the ground, the evidence of broken lives is everywhere. A new paved road flanked by barbed wire winds through the hills of Al-Walajah, marking the route of the future fence. Built three years ago, the road is for construction workers and vehicles, not villagers. But for the past two months, no one has been seen at work. “They will come back,” Atta Al-Arja, one of the 2,500 inhabitants of Al-Walajah, said while sipping coffee in his house. His three-bedroom home, and his personal history, perfectly exemplify the separation between Israelis and Palestinians, and the suffering it still brings. The house lies in the half of the village included in the Jerusalem municipal boundaries after the 1967 war. The remaining part of Al-Walajah is classified mostly as "area C," under Israel’s jurisdiction based on the 1995 Oslo Agreements. “Jews will take this hill, as they did with the one in front during the 1948 war. Not only were the villagers stripped of their lands and forced to resettle here, but in 1999 Israeli authorities sent them official warnings against any new construction without a permit. Now, you well know that a permit is almost always denied for ‘security’ reasons,” Al-Arja said as he sat on his patio overlooking the valley. “So later, demolition orders were issued for around 60 houses of the village, including mine. Half of them have been demolished,” he added. A thin, stubborn man in his late 40s, the father of four banded together with dozens of families and an Israeli lawyer to seek justice in the Israeli courts. While recounting his story, he spread out the mass of legal papers and maps he has collected over the years. During the years of litigation, Al-Arja’s permit allowing him to work in Israel was revoked several times (Palestinians with Israeli-issued IDs from the West Bank are not allowed to enter Jerusalem without special permits). This eventually cost him his job as a handyman in a religious institution in Jerusalem. Without a stable income, Al-Arja has barely managed to pay the monthly installments on a fine (18,500 shekels, or $5,200) he received in 2005 for building without a permit. His house remains subject to a demolition order. Other residents of Al-Walajah face even greater difficulties. The new road marking the route of the future barrier cuts off a farmer, Abu Nidal, from his land. In response to his complaints, Israeli authorities cut an opening through the foundations of the road to give him access to his fields -- not to farm, but so that he and his family can visit their ancestors’ graves. Omar Hajajlah and his family will have their house completely encircled by the security barrier, leaving only a few square meters of space around their property. Their only connection to the village will be a new tunnel built by the Israeli authorities. The tunnel will run below a paved road leading to an entrance to Har Gilo, an Israeli settlement of about 500 people established in 1972. Palestinians are forbidden from using this paved road and others like it that connect settlements throughout the West Bank. The other way out of Al-Walajah is a road to the neighboring Cremisan Valley, but that was closed last week with a gate and two concrete blocks. “The route of the barrier around Hajajlah’s house and the entire village of Al-Walajah does not seem to respond to a security need but to a policy of land confiscation carried out by the Israeli government,” said Aaron Garcia, a volunteer for Ecumenical Accompaniment Program in Palestine and Israel, or EAPPI, a religious organization advocating for peace. The Israeli government disagrees. The barrier is a security need, it maintains, backing up that claim with numbers. “In 2002 during the height of the Intifada, there were 13 mass suicide bombings in Jerusalem, and since then there have been a mass shooting with eight casualties at a religious seminary in 2008 and scores of attempted bombings and attacks thwarted in the last two years,” wrote Josh Hantman, a spokesman for Israel’s Defense Ministry, in response to an interview request. There are only two areas around Jerusalem where the barrier is still unfinished. One is a few kilometers to the east of the city. The other is south of Jerusalem and includes Al-Walajah, the Cremisan Valley to the east of the village, and the town of Battir to the west. According to the United Nations Office for the Coordination of Humanitarian Affairs (OCHA), a 1.4-kilometer (0.8-mile) concrete wall planned as a section of an 8-kilometer (5-mile) barrier here has already been built. Like their neighbors to the west, residents of the Cremisan Valley are familiar with the barrier. Among them is a convent of Salesian Sisters that was established in 1960. The nuns sought to have the route of the barrier amended so that their property would remain on the Palestinian side, thereby allowing the Christian community of Beit Jala continued access to the church and the primary school run by the sisters. The nuns’ request was granted by the Israeli Special Appeals Committee for Land Seizure; however, the amended route will separate the nuns from a nearby monastery of Salesian monks. The monastery and its renowned vineyards will be on the Israeli side of the barrier, and the only connection to the convent will be through an agricultural gate. Israeli authorities may approve another agricultural gate in Batir, a Palestinian town of 5,000 famous for its irrigation system, which dates back to the Canaanite and Roman period and is still in use. The gate would allow villagers to access 740 acres (300 hectares) of their farming lands that will lie on the Israeli side of the fence after it is built. Batir has not been associated with any major security-related incident for more than 60 years. Yet Israel’s Defense Ministry has confirmed plans to build a fence there, claiming it is necessary to protect tracks used by trains running between Jerusalem and Tel Aviv. Earlier this month, following petitions submitted by local residents, an NGO and the Israeli Nature and Parks Authority, the Israeli High Court halted the construction of the barrier and ordered the Defense Ministry to examine alternative routes. But the gates might not be a solution, after all. A military or legal order may change the route of the fence at any time. The original route in the southern outskirts of Jerusalem was originally planned to be several circles isolating Al-Walajah, Batir and other two nearby villages. In addition to the fence, the other flashpoint between Israelis and Palestinians -- the building of Israeli settlements -- remains. Last week, tensions rose in response to the Israeli Ministry of Defense’s announcement of a plan to build almost 300 housing units in the settlement of Beit El, close to the Palestinian town of Ramallah, in the northern West Bank. That announcement came just ahead of the fourth visit to Israel and the Palestinian territories this year by U.S. Secretary of State John Kerry, who has been trying since taking office in January to revive peace talks stalled since 2010. The U.S. State Department warned Israel that the decision to build is hindering the peace process. Confronted by the complicated facts on the ground, Kerry may well find himself next week faced with what looks like an impossible mission.